These cutie little hearts are filled only with gorgeous dried lavender! Use them as a key-ring, to hang in your car or in your wardrobe. Even better, give as a gift! 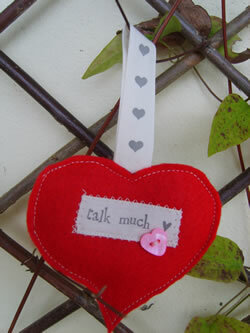 These are individually handmade using felt and a sweet ribbon loop to hang up. When the fragrance begins to fade, just scrunch up a little bit to revive the lovely lavender scent. Large heart measures approx 9cm at widest point and the small heart measures 6.5cm. Large lavender filled heart are £5 and small lavender filled hearts are £4 each.